Andy and I took a long drive through Skagit County the other day for photos – and also to hit up the small shops in LaConner for a belated birthday gift I’d had in mind for a friend. On the road to LaConner, we passed an old barn that had been marked, “no trespassing”. Well, if you follow my blog at all, you know that I’m not easily deterred by trespassing signs. 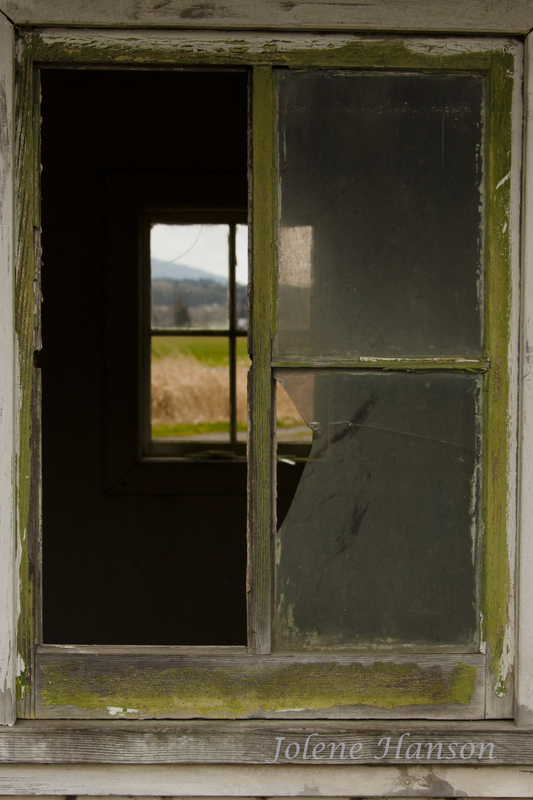 I thought these two windows made an interesting shot, so I think it was worth the stop. Plus, if you’re kind of in the road is it really trespassing? Another amazing shot. Definitely a favourite of mine–and very inspirational. Maybe I’ll be brave enough to stop the next time I see an old building on the side of the highway. very interesting composition, Jolene! The green in the distance goes nicely with the green on the window. i, too, snapped some photos of an old barn and house this past weekend … i didn’t see any “no trespassing” signs, but they likely wouldn’t have deterred me either! Thanks, Joseph! I was actually thinking of that whole “grass is greener” saying as I snapped this. I love the history in old objects and places. nicely framed and that green color is too much! Thank you, Sheila – the frame of the window seemed like a logical way to frame this particular shot. Very nicely composed and framed! Interesting perspective. Nice photo. It’s funny how a ‘No Trespassing’ sign essentially alerts you to the fact that you’re almost guaranteed to find something interesting to photograph beyond. A sign like that probably attracts more people (well photographers at least)than they deter. It’s so true! It’s the forbidden that’s attractive, I think. Thanks – to me it almost has a 3D feel.